Sept 4th. The Bird Scarers. As part of our ongoing mission to bring new acts to the club we start the new season with a great combination - an all female trio who are three generations of the same family. 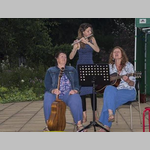 Val, Jane and Rosie sing in close harmony both contemporary and traditional songs intricately arranged for guitar fiddle, flute or viola. Based in the Staffordshire area the band has been playing at folk clubs and festivals for many years.